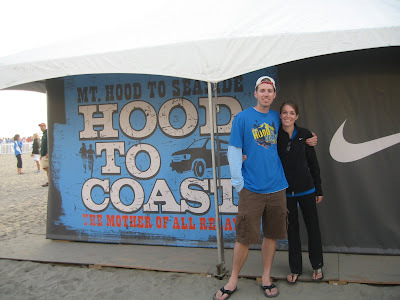 After many months of planning and training the Hood to Coast Relay came and went. It was a blast! Thanks to everyone on the team that helped make it such a fun, memorable experience! 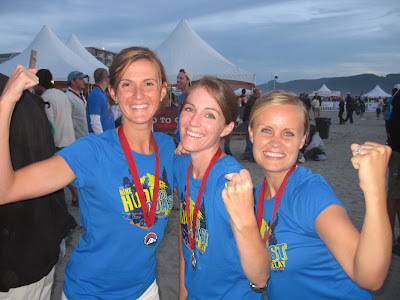 I could not have picked better people to run 197 miles with!! Van 1-Pre-Race photo, sorry about the black and white my camera was in the wrong setting. Our team name was Almost There, there were definitely times that it did not feel that way! Van 2 left to right: Mallory, Nathan, Joanna, Alex, Megan, Will Jeremy and Thomas showing their "guns", happy to be finished with their 1st leg. Half asleep getting ready to start our 2nd legs which would all be in the middle of the night. This was by far my favorite and my fastest leg. Thank you to my awesome and talented sis-in-law Ellen for all of her hard work on the decals for our van! 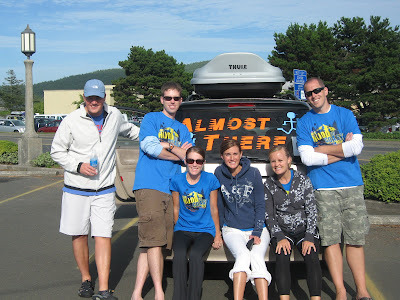 After our 2nd legs we drove to the place where we would meet up with Van 2 to begin our 3rd legs. When we got there the guys and Marcae slept out in their sleeping bags. Kristin and I preferred the warm van. We were all a little envious of Marcae who could sleep just about anywhere. We used a lot of these which were amazingly clean and not smelly. Atleast that was my experience!! Kristin during her 3rd and final leg!! Yeah! Once we got to the beach we got to have a shower, that was an experience! Just think junior high locker room. Anyway we were happy to not be covered in dried sweat anymore. This is us post shower waiting for Van 2 to finish and meet us at the finish line. Boy do we need sleep! We look pretty tough, don't we???? The finish line was great, chaotic but great. 12,000 runners, lots of spectators, food, music, the ocean, a beautiful sunny day, you can't ask for much more! Enjoying the moment while waiting for Megan to finish our last leg and meet us at the finish line! So proud of her!!! Megan is my neice who flew up from Utah to run with us! Thank you to Marcae also for flying up from Utah! It would not have been the same without these ladies!! Shout out to Brian, Marcae's husband who kept their 4 month old while she ran! Running toward the finish line, what an awesome feeling of accomplishment and team spirit! 29 hours, 11 minutes, and 45 seconds later we are still smiling and have made many memories in the process! Thanks to an awesome team and to all those who put up with all of the stress that I went through planning it! It was all worth it! Love you guys! Great report, Steph. It sounds like you had a fun H2C experience. Props to you for being the organizer. I haven't been the main person yet. I am thinking of putting together a team for next year, so I would love your advice! you guys are amazing!!! It looks like you had tons of fun! !